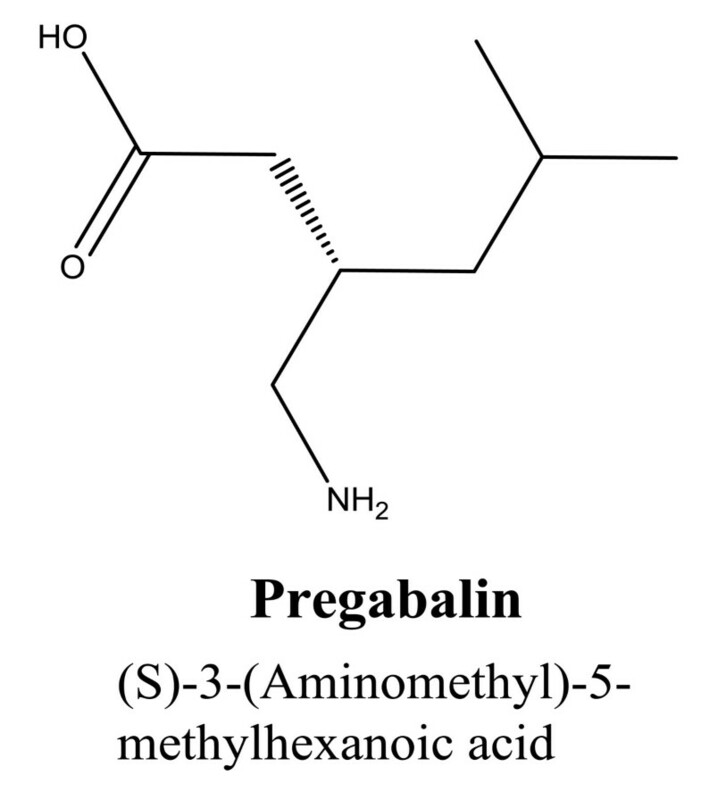 Pregabalin, a γ-amino-n-butyric acid derivative, is an antiepileptic drug not yet official in any pharmacopeia and development of analytical procedures for this drug in bulk/formulation forms is a necessity. We herein, report a new, simple, extraction free, cost effective, sensitive and reproducible spectrophotometric method for the determination of the pregabalin. Pregabalin, as a primary amine was reacted with ninhydrin in phosphate buffer pH 7.4 to form blue violet colored chromogen which could be measured spectrophotometrically at λmax 402.6 nm. The method was validated with respect to linearity, accuracy, precision and robustness. The method showed linearity in a wide concentration range of 50-1000 μg mL-1 with good correlation coefficient (0.992). The limits of assays detection was found to be 6.0 μg mL-1 and quantitation limit was 20.0 μg mL-1. The suggested method was applied to the determination of the drug in capsules. No interference could be observed from the additives in the capsules. The percentage recovery was found to be 100.43 ± 1.24. The developed method was successfully validated and applied to the determination of pregabalin in bulk and pharmaceutical formulations without any interference from common excipients. Hence, this method can be potentially useful for routine laboratory analysis of pregabalin. Pregabalin (PRG), (S)-3-(aminomethyl)-5-methylhexanoic acid (Figure 1), is an antiepileptic and structurally related to the inhibitory neurotransmitter aminobutyric acid (GABA) It was recently approved for adjunctive treatment of partial seizures in adults [1, 2] in United States and Europe and for the treatment of neuropathic pain from post therapeutic neuralgia and diabetic neuropathy. Currently, there is no official analytical procedure for pregabalin in any pharmacopeia. Several reports are there in literature for PRG determination based on chromatographic methods, i.e., gas chromatography-mass spectrophotometry (GC-MS), LC-MS-MS [3, 4], HPLC [5–7] coupled with varying detection techniques like tandem mass spectrometry , fluorometry  and enantiospecific analysis . These methods may involve procedural variations including pre- and post- column derivatization . Recently, capillary electrophoresis and nuclear magnetic resonance technique was reported for PRG involving complexation with cyclodextrins . All these are complex trace analysis techniques most of which have been employed for PRG determination in biological fluid samples. However, routine analysis of the drug in bulk powder and pharmaceutical preparations in research laboratories and pharmaceutical industry requires a relatively uncomplicated and a more cost effective method like UV/visible spectrophotometry or spectrofluorometry. Pregabalin, as such, has a poor UV/visible absorbance profile (Figure 2) and very few reported methods have relied on generation of a chromophoric product by reaction of the drug with some suitable reagent. Considering the limited literature reports available in this area [12–14], we found it very pertinent to investigate and develop a novel spectrophotometric method for determination of pregabalin in bulk powder and pharmaceutical preparations. Ninhydrin has been used as a chromogenic agent in spectrophotometric analysis of several amino acids, peptides and amines . The present study describes the evaluation of ninhydrin as a chromogenic reagent in the development of simple and a rapid spectrophotometric method for the determination PGB in its pharmaceutical dosage forms. The procedure does not involve any extraction step with any organic solvent and can be directly carried out in phosphate buffer pH 7.4 which makes it ideal for routine analysis of the drug in bulk or in pharmaceutical formulations. 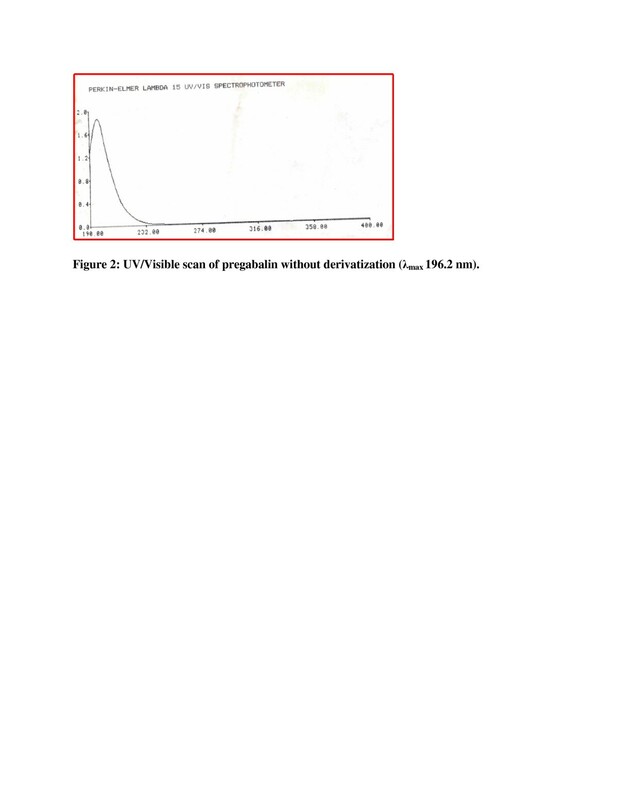 UV/Visible scan of pregabalin without derivatization (λ max 196.2 nm). In our efforts to design a novel spectrophotometric method for quantification of pregabalin, we investigated its derivatization with ninhydrin ((triketohydrindene hydrate) for generation of a chromophoric product. Figure 3 shows the UV/visible spectrum of the chromophoric derivative. The procedure involves formation of purple colored product by reaction of pregabalin with ninhydrin by heating at a temperature of 70-75°C for 20 minutes. Reaction of ninhydrin 1 with amines, alpha amino acids, peptides, and proteins yields an aldehyde with one carbon atom less than the alpha-amino acid; and carbon dioxide in stoichlometric amounts and varying amounts of ammonia, hydrindantin and a chromophoric compound known as Ruhemann's Purple (2-(3-hydroxy-1-oxo-1H-inden-2-ylimino)-2H-indene-1,3-dione). This pigment serves as the basis of detection and quantitative estimation of alpha-amino acids.13 Mechanism proposed (Figure 4) for the reaction involves removal of a water molecule from ninhydrin hydrate 1 to generate 1,2,3-indantrione 2 in the first step, which then, forms a Schiff's base with the amino group of pregabalin resulting in the ketimine 3. 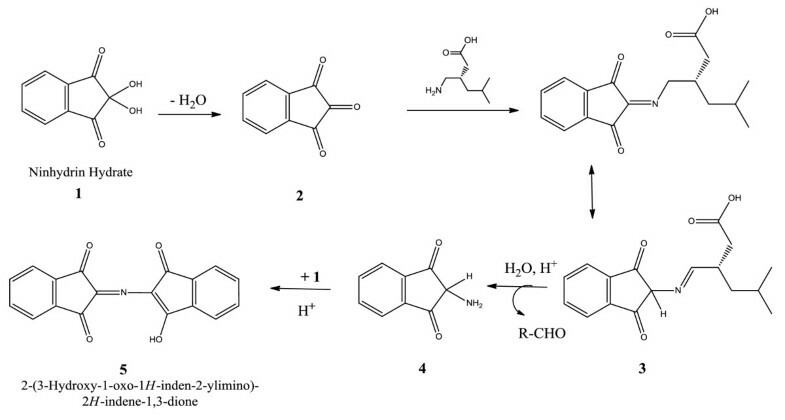 Removal of the aldehyde RCHO generates an intermediate amine 4 (2-amino-l,3-indandione). Condensation of this intermediate amine with another molecule of ninhydrin follows to form the expected chromophore 5 (Ruhemann's Purple). The rate-determining step in the entire sequence of the ninhydrin reaction is the nucleophilic-type displacement of a hydroxy group of ninhydrin hydrate by a non-protonated amino group. UV/Visible scan of the chromophoric product of pregabalin (λ max 402.6 nm). 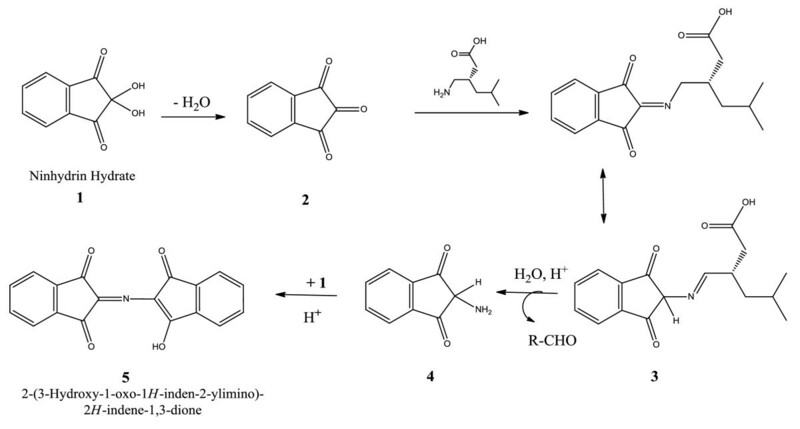 Mechanism of generation of chromophore (Ruhemann's Purple) by reaction of pregabalin with ninhydrin. Of the buffers investigated (acetate buffer, phosphate buffer), colour development was noted in case of phosphate buffer. The optimum buffer pH was found to be 7.4 and lower pH ranges resulted in an insufficient colour development. The addition of 1.0 mL of ninhydrin solution (0.2% w/v) was sufficient to obtain the maximum and reproducible absorbance values for the various concentration ranges of PGB. Smaller amounts resulted in incomplete reaction. Further increase in the concentration had no significant effect on complex formation, although absorbance increased slightly owing to the reagent background used. The effects of temperature and heating time on the formation of the coloured complex were also optimized. At room temperature, the addition of ninhydrin did not lead to the formation of any coloured product and higher temperatures were required to accelerate the reaction. The colour intensity increased with increasing temperature and maximum absorbance was obtained following heating on a water bath at a temperature of 70-75°C for 20 minutes. Further heating caused no appreciable change in the colour. The complex obtained was highly stable for more than 6 h.
The method was validated with respect to linearity and range, accuracy and precision, limit of detection (LOD) and limit of quantification (LOQ), selectivity and robustness. The developed method was validated for the pure drug as well as marketed formulation of pregabalin (Pregabalin 75; Torrent pharmaceuticals) and the various validation parameters are shown in Table 1. 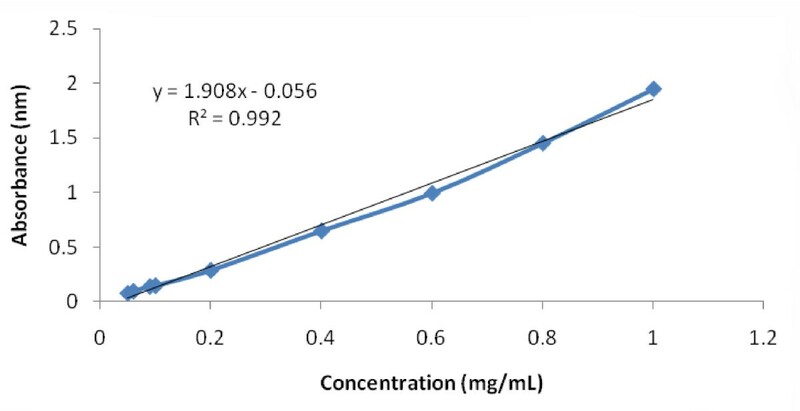 The regression plots showed compliance with Beer Lambert's law (linearity) in the concentration range of 50 μg/mL-1000 μg/mL with a correlation coefficient (r2) of 0.992. The standard plot is given in Figure 5. Table 1 summarizes the performance data and statistical parameters for the proposed method including concentration ranges, linear regression equation, correlation coefficient, molar absorptivity, Sandell sensitivity limit and these indicate a good linearity over the working concentration ranges. Standard plot of pregabalin by ninhydrin method. Precision were investigated by analyzing different concentrations of pregabalin (0.2-1.4 mg/mL) in three independent replicates on the same day (intra-day precision) and on three consecutive days (inter-day precision). The data is represented as relative standard deviation (RSD) and results have been shown in Table 2. Low relative standard deviation (RSD) values for intra- day and inter- day analysis indicate good precision of the method. Recovery values from standard addition method followed for the bulk drug analysis ranged from 96.5 to 100.3% (Table 3). Recovery studies with marketed formulation returned values ranging from 97.09 to 99.74% (Table 4). a Average of determinations carried out in triplicate. Satisfactory values of the mean recovery values ± SD, RSD % and Er % in recovery studies in drug formulation (Table 4) revealed that there is no potential interference of the excipients listed by the manufacturer, i.e., talc, lactose monohydrate and maize starch. This may be attributed to the dependence of the reaction in the proposed method on the presence of a primary aliphatic amino group in the drug molecule which is not present in any of these excepients. LOD and LOQ of the method were established using calibration standards (Table 1). LOD and LOQ were calculated as 3.3 σ/s and 10 σ/s, respectively, as per ICH definitions, where, σ is the mean standard deviation of replicate determination values under the same conditions as the sample analysis in the absence of the analyte (blank determination), and s is the sensitivity, namely the slope of the calibration graphs. Repeatability is based on the results of the method operating over short interval of time under same conditions. Robustness was examined by evaluating the small variations in different experimental conditions such as heating temperatures (± 2° C), working wavelengths, volume and concentration of reagents. Three replicate determinations at six different concentration levels of the drugs were carried out. The within-day RSD values were found to be less than 0.6% indicating that the proposed method has reasonable robustness. The stability of the final sample solutions was examined by their absorbance values and responses were found to be stable for at least 6 hours at room temperature. Table 5 gives the results of the assay for pregabalin carried out on marketed formulation by the proposed method and revealed that there is close agreement between the results obtained by the proposed methods and the label claim. The recovered drug content was found to be 99.48%. aAverage of nine determinations, three each with starting powder amount equivalent to 30, 60 and 90 mg pregabalin. The results with the proposed method for the determination of pregabalin in its pharmaceutical formulation (Pregabalin75 capsules) suggest satisfactory recovery. Further, standard addition technique followed to check the validity of the method have given good recoveries of the drug in presence of formulation suggesting a noninterference from formulation excepients. Hence, this method can be recommended for adoption in routine analysis of pregabalin in in quality control laboratories. The method proposed is simple, rapid, inexpensive and sensitive for the determination of pregabalin in bulk as well as in marketed form (capsules). There is no requirement of any sophisticated apparatus as in chromatographic methods. Omission of an extraction step with organic solvents is an added advantage. The method has been validated in terms of its sensitivity, simplicity, reproducibility, precision, accuracy and stability of the coloured species for ≥ 6 h suggesting its suitablility for the routine analysis of PGB in pure form (in bulk analysis) as well as pharmaceutical formulations without interference from excipients. All absorption spectra were recorded using a Perkin Elmer lambda 15 UV-Visible spectrophotometer (German) with a scanning speed of 60 nm/min and a band width of 2.0 nm, equipped with 10 mm matched quartz cells. A CyberScan pH 510 (Eutech instruments) pH meter was used for checking the pH of buffer solutions. All chemicals and materials were of analytical grade and were purchased from Qualigens fine chemicals, Mumbai, India. All solutions were freshly prepared in double distilled water. Pregabalin (PGB) pure grade was graciously provided as a gift samples by Vardhman Chemtech limited, Derabassi, Punjab, India. Pregabalin75 capsules (label amount 75 mg PGB/Capsule) Torrent Pharmaceuticals were purchased from the market. Phosphate buffer pH 7.4 was prepared by mixing 250 mL of 0.2 M potassium dihydrogen phosphate with 195.5 ml of 0.2 M NaOH and making up the volume to 1000 ml with distilled water. The pH of the buffer was adjusted to 7.4 using a precalibrated pH meter. Stock solution of pregabalin (2 mg/ml) was prepared by dissolving 200 mg of pregabalin in 100 mL of phosphate buffer (pH 7.4). The 0.2% solution of ninhydrin was prepared by dissolving 200 mg of ninhydrin in 100 ml of ethanol and was kept in an amber colored bottle. Different aliquots were taken from the stock solution (2 mg/ml) and diluted with phosphate buffer pH 7.4 to prepare a series of concentrations ranging from 50 to 1000 μg/mL of pregabalin. To 5.0 mL of these aliquots taken in stoppered tubes, 1.0 mL of ninhydrin solution (0.2% w/v) was added and heated on a water bath at a temperature of 70-75°C for 20 minutes. The tubes were kept covered to avoid the loss of solvent due to evaporation. After cooling the solution to room temperature, the absorbance values were measured in triplicate at 402.6 nm against mixture of 5.0 mL phosphate buffer (pH 7.4) and 1.0 mL 0.2% ninhydrin as reagent blank. The calibration graph was obtained by plotting the absorbance values at the λmax of the drug (402.6 nm) against corresponding concentration values and compliance with Beer Lambert's law was assessed. The contents of twenty capsules were mixed and weighed accurately. Separate quantities of the powder equivalent to 30 mg, 60 mg and 90 mg of PRG were transferred into a 100 mL volumetric flasks, dissolved in water, and sonicated for 5 min., the volume was then completed with water, shaken well for 5 min. and filtered into a dry flask. To 5.0 mL aliquots of the filtrate taken in stoppered tubes, 1.0 mL of ninhydrin solution (2.0% w/v) was added and solution heated on a water bath at a temperature of 70-75°C for 20 minutes. Solutions were cooled to room temperature and the absorbance values noted in triplicate at 402.6 nm against reagent blank. AB conceived and supervised this research work, participated in the data analysis and drafted the manuscript. PG carried out the drug analysis and the validation studies.